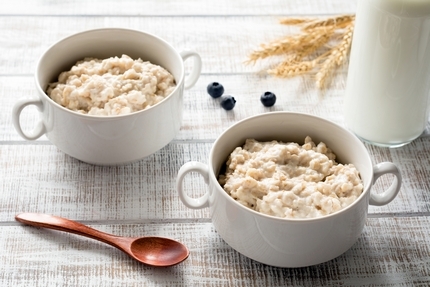 The Scottish Porridge Recipes below are quick and easy to make and taste delicious. It is a hearty meal for breakfast that helps to keep you feeling full for a long time and is a great source of fibre. It is enjoyed not just in Scotland but throughout the world. It is thought that it can help lower cholesterol if taken along with a general healthy diet and lifestyle. In the book A Cook's Tour of Scotland by Sue Lawrence she describes how a nutty flavoured porridge was obtained by roasting the oatmeal. She learnt this tip whilst judging at the 12th Annual World Porridge making Championships in Carrbridge in the Scottish Highlands. Other names for porridge include the old Scots word porage. Eating in has a coconut milk porridge recipe using pinhead oatmeal or oats and is served with blueberries, banana slices and coconut flakes. In olden days there were many myths surrounding porridge such as having to stir it clockwise whilst cooking otherwise the Devil would get the cook. The spoon used to stir the porridge was called a spurtle which some people still call a theevil. In Shetland the spoon is called the gruel-tree (cited in the book The Scots Kitchen by F. Marian McNeill). It was also the custom in olden days to eat porridge standing up (cited in the Three Chimneys Recipe Book. Scottishrecipes are not sure why it was eaten standing up but some theories include standing being an aid to digestion or that farmers and crofters who ate it to fill them up for a busy and long working day were doing other things whilst eating their breakfast. These same crofters and Highland farmers had a porridge drawer in their kitchen where the remains of any cooked porridge would be emptied into. This was then allowed to cool down and would later be cut into slices so that they could take these slices as a snack for later in the day. The book Scots Cooking: The Best Traditional and Contemporary Scottish Recipes by Sue Lawrence describes how in the evening slices from this drawer in the kitchen dresser would be fried and served with eggs or fish. These porridge slices were called calders. A thinner and more watery version is known as gruel. This is more likely to have been eaten by prisoners such as Ronnie Barker in the TV series Porridge about prison life! The book A Cook's Tour of Scotland by Sue Lawrence has a delicious porridge recipe using medium, coarse or pinhead oatmeal, cold water and salt. Others from Sue include porridge scones with cream and brown sugar and warm raspberry porridge. The topic of what to add rages on. Traditionalists advocate adding salt though nutritionalists and doctors now know that salt is bad for the heart and should be avoided. Many Scots liked to add a wee dram of whisky or rum but this is not advisable if you are to drive during the day or go to work or have other responsibilities and is not the best start to the day (though some would say it is a great start to the day!). One recommended by chef Gordon Ramsey can be found in Taste Ye Back: Great Scots and the Food That Made Them and includes toppings such as Greek yoghurt, runny honey, brown sugar and flaked almonds. Many like to add milk or cream, sugar, honey, cinnamon, golden syrup, jam, berries, prunes, dried fruit, nuts like walnuts and fresh fruit such as bananas. 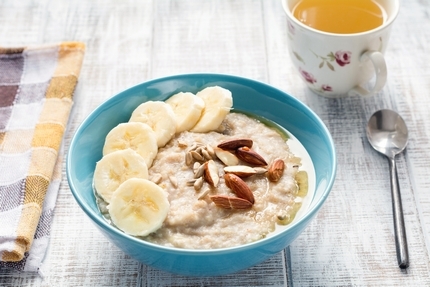 More healthier porridge recipes would include toppings of fresh fruit such as chopped apple, bananas or fresh berries so that the eater can receive extra fibre and some of their five daily portions of fruit. A delicious Caribbean porridge recipe by Levi Roots (Reggae Reggae sauce and Dragon's Den on BBC2) can be found in Caribbean Food Made Easy and includes ingredients such as allspice berries, nutmeg, clove, cinnamon, coconut milk, tropical fruits and pecans. The book Sue Lawrence's Scottish Kitchen: Over 100 Modern Recipes Using Traditional Ingredients has a porridge with stewed rhubarb recipe. 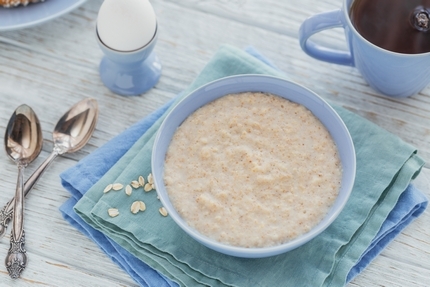 In her other book Scots Cooking: The Best Traditional and Contemporary Scottish Recipes Sue Lawrence describes her parents would eat their porridge in a traditional Scottish way by having a separate milk bowl. The porridge would be served in its own wooden bowl and eaten with a horn spoon and dipped into the milk bowl. That way it kept hot whilst the milk kept cold. This method is also written about in the book The Scots Kitchen by F. Marian McNeill. In her book Clarissa's Comfort Food Clarissa Dickson Wright recommends using pinhead oatmeal and she cooks hers using a double boiler. 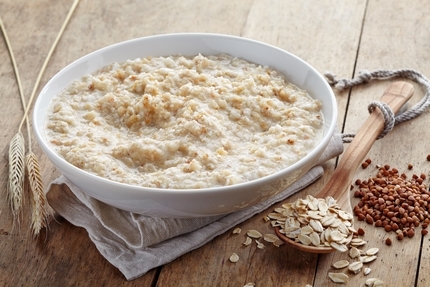 How to make porridge the traditional Scottish way is to use the finest Scots porridge oats or a good quality oatmeal. Though the Scottishrecipes.co.uk team like to use the Tesco own label porridge much more than the more expensive ones. It has a lighter and creamier texture and is easy and quick to make. Ideally soak the oats overnight in the quantity of water needed for each portion. This results in it being fluffier and tastier and is especially important for those using finer oatmeal. Traditionally you should stir clockwise but stirring this way and anticlockwise would help break up the oats and stop it sticking to the saucepan. Some like to cook porridge recipes with water, other milk and some use half quantities. The preference of www.scottishrecipes.co.uk is to use water for the cooking and once the portion is in the bowl we like to add cold milk or a chopped banana. So getting back to how to make porridge. The easiest way to describe this is to use 50 grams of oats per portion to 300mls of water or milk. Mix this into a pan and heat on a medium setting on the stove or hob. Stir continuously and once thickened turn off the heat and serve. Those who prefer to use oatmeal, especially medium oatmeal or pinhead oatmeal will need to allow up to 30 minutes simmering time until it is thoroughly cooked. Those wanting a quick meal should stick to Scotch porridge oats. This has the added advantage of being able to be cooked in the microwave. If using pinhead oatmeal, which gives a more delicious flavour, then ScottishRecipes takes the advice from the book Scots Cooking: The Best Traditional and Contemporary Scottish Recipes by Sue Lawrence which suggests one cup of medium or coarse pinhead oatmeal be mixed with three cups of cold water and a pinch of salt if needed and left to soak the night before. This is then slowly brought to the boil in the morning and cooked for about ten minutes whilst being stirred frequently. Pinhead oatmeal will need another five minutes cooking time. The Book Maw Broon's Cookbook has another traditional Scottish porridge recipe which suggests using a mixture of coarse and medium oatmeal though with a cooking time of thirty minutes. Buy Maw Broon's Cookbook at a discounted price and with free delivery available. Leading cook book author and food writer Claire Macdonald has an easy way to making porridge in an Aga. She suggests mixing pinhead oatmeal, soft brown sugar, milk, a pinch of cinnamon and nutmeg and leaving this to simmer on the Aga hotplate before leaving overnight in the simmering oven. A common phrase in Scotland to use when someone is exaggerating, not being listened too or believed or haverring as we Scots say is Save Your Breath To Cool Your Porridge. Other variations include keep your breath to cool your porridge. The annual Porridge Making Championship takes place in Carrbridge, Scotland where the winner of the best traditional porridge made from water and oatmeal wins the much coveted prize of a golden spurtle trophy. Many professional chefs and home cooks take part in the Porridge Making Championship with many celebrities appearing at the event such as that year's Miss Scotland. It is sponsored by Hamlyns of Scotland who also generously provide a cash and hotel prize to the winner. Their is also a prize for the category of speciality porridge where other ingredients for porridge can be used. During the day there are stalls, entertainment, locally produced food and tastings. Visit www.goldenspurtle.com for more information. The largest bowl of porridge recorded by the Guinness World Records was made by the Cupar Round Table in association with Scott�s Porridge Oats on 4 July 2010 during the Cupar Highland Games with 630kg of oats in the bowl. World Porridge Day for Marys Meals.